My MIL is like the plant whisperer. So, I wasn’t surprised two weeks ago when bags full of summer squash started appearing on my doorstep. Seriously, these things were huge…and plentiful. But I was stuck in a rut. A zucchini rut. 3. Shredded or diced and hidden in various casseroles to trick my kids (and husband?) into eating more veggies. While I love all of these uses for zucchini, I knew there had to be some sort of unheard of zucchini greatness out there to help shake things up and pull us out of our rut. I don’t normally fry our veggies, but when I saw this recipe I immediately decided I was making an exception. 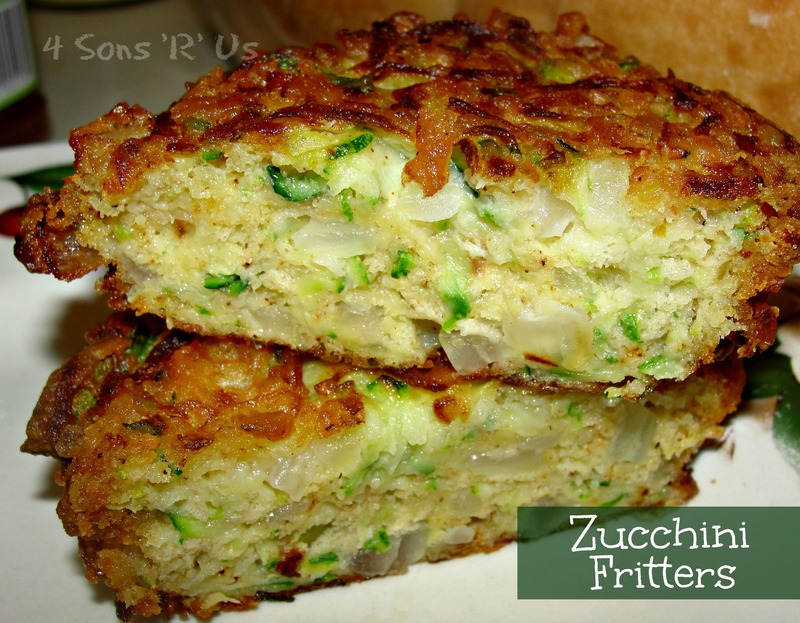 The hubs took one bite and couldn’t believe that something so delicious could be made from just zucchini and onions. They reminded of a crispier version of potato latkes. They’re great plain, but the spiced mayo makes a perfectly paired dip adding just the right amount of tang & spice. We served the fritters as a side with dinner, but they would also make a great light lunch. Looking for a way to rise out of your own stagnant zucchini or side-dish rotation? Is your bounty overflowing with the green garden veggies and you need to get creative to use them all up? Whatever your reason, you can’t go wrong with these. Just look at them. Gorgeous, isn’t it? They taste just as great. 1. Pour the oil in a skillet so that it is half an inch deep and turn the heat to medium. 2. While waiting for the oil to heat up, combine the zucchini, onion, and eggs in a large bowl. Stir the mixture to combine. It may get a little frothy, but that’s ok.
4. To finish the batter, add the dry ingredients to the zucchini mixture and fold it all together. 5. Once your oil is hot (dip a spoon with some batter on it into the oil to test, if the oil starts bubbling in contact with the batter, it’s ready) you can drop the batter a tablespoon at a time into the oil, frying for 2-3 minutes per side. If you want a more substantial fritter, form the batter into loose ‘patties’ and fry in oil 3-4 minutes per side. 6. When the centers are firm, remove them from the oil and allow the to drain on a plate lined with a paper towel. 7. To make the dip, simply combine the prepared mayo, lime juice, and chili powder in a small mixing bowl and stir it all up. wow! looks delicious! i love zucchini! We do too! I can’t ever seem to keep enough on hand, even with frequent deliveries from my MIL. Wow! This sounds amazing! Truly amazing! I love anything with zucchini and we always have an abundance at the farm. These look great, can’t wait to try! Same here 🙂 I love it when I discover a new use for it, too! Love the fritters but that mayo rocks my world! The fritters are fabulous, but you’re right about the mayo. I’m on a mission to see what other things it will pair well with. PS if you would like to join in the Food on Friday group let me know if you would like an email reminder each week. Thanks for the invite Carole! I would love to link up with Food on Friday 🙂 An email reminder would be fantastic as well. They look lovely.. have bookmarked your recipe..thanks! Ah yes, the zucchini season. Ours get so big, but they are very sweet. We’re now in winter and still sating the last of the late summer harvest. We have some good bulk meals to cook from them, but there’s no hiding the zucchini component. There look like a great Saturday morning breakfast option. I’ll have to mark it for next summer. These would make a filling breakfast! 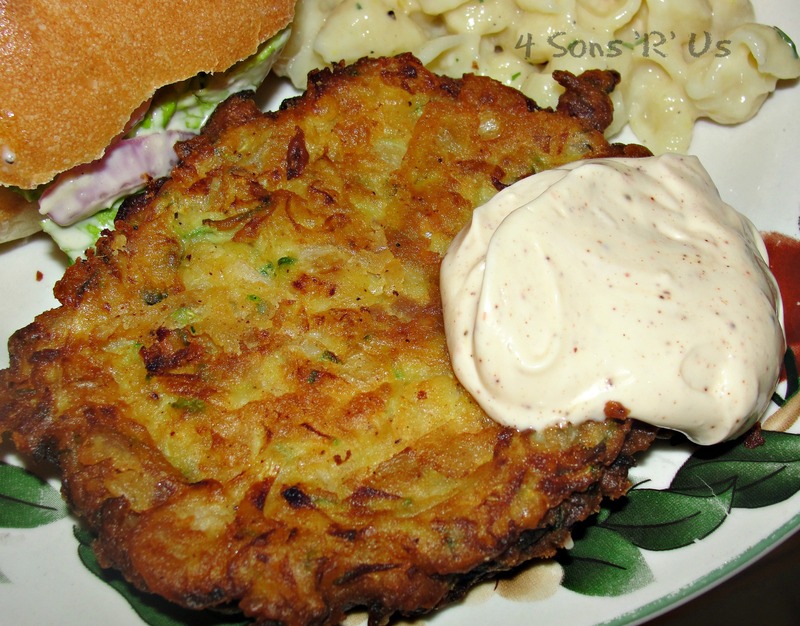 I can’t wait to try your Zucchini Fritters with this awesome Chili Lime Mayo! Thanks so much for sharing this awesome recipe with Full Plate Thursday and come back soon! Let me know what you think! Zucchini/squash season is my favorites!! I bet you could cook these in a waffle iron instead. I do that with hash browns and they turn out crispy good! That’s a fantastic idea Ruth! I am going to have to give it a go on both. The hubs always cooks a big breakfast on the weekends and hashbrowns are a staple. I leave them to him because pan frying them takes me forever. Can’t wait to try this.Need to get lime And then. I plan to try this.I have the zucchini. Betty you can also substitute lemon juice if you have that on hand. I got your reciepe on the Fritters and I intend to make them very soon. I was looking for a great one and I think you nailed it for me. I am from the South and never seen a reciepe like this one and I now live in California but the blood still the same from the south. I just love Zucchini and can you send me your web site so I can put it in my Favorites. Southern traditions sure do run strong. Hope these gave you a happily nostalgic experience. making these for supper tonight along with a hamburger/cabbage casserole. we love zucchini and have even gotten other people who say they don’t like it to eat it. keep the awesome dishes coming. Thanks, Laura! I definitely will keep turning them out. We hadn’t ever eaten it before a few years ago, and now we absolutely love it. Don’t you just love that feeling when you can create a foodie convert?! Trying these now and hoping for the best. So glad you liked them!! I have plenty more zucchini recipes coming. Have you seen the cheesy zucchini rice? That’s another fav around here. They look great would like to make saw where someone baked and they came out great.would like to find what temp and time they used can’t find it now.anyone know what temp and time,also how many approx per batch make? Thank you so much for sharing this recipe, it was so easy to put together and everyone loved them! I’ve been trying to find a fritter recipe that doesn’t require salting the squash and squeezing out the water. These will definitely be put into my rotation. Hi do you have a gluten free version of this recipe? Making these tonight. Get back to you later. I would like that rice recipe you mentioned in an earlier post. Ohh those were awesome. Love the sauce. These are officially my new favorite food!